Pretty but heavy, gold scratches easily too. It would have been better if it turned on and off when you opened and closed the case. Wished it was more durable! The item was the quality I would have expected from Ted Baker. I love this phone case. Whenever I get my phone out of my bag, people always comment how gorgeous the cover is and ask to view and handle it themselves. Perfect fit, sweet little miirror. Fabulous design. Very chic. So glad I bought this phone case ,really pleased with it ,great service aswell. I was very excited to receive this product as it was my Christmas present to my self. I have had it for one week. This product is already showing scratch marks on the front along the raised edge and the green leaf at the front. I am a very careful user and the phone is usually in my handbag which does not contain items that would lift the print. I also have a Samsung Quick charge device which will not work with the cover on. Fits perfectly looks beautiful. What more can a girl want?! This case was a Xmas gift and as it arrived so late I had no time to return it prior to Xmas day. The case is damaged on one of the corners but is still usable so as the case was needed for a new phone that needed to be protected immediately as this was a xmas gift as well we had no choice but to use it even with the damage. Beautiful phone case as expected from Ted Baker.Fits perfectly and so handy with mirror inside. Speedy delivery and well packaged. I would definitely order from here again. Sturdy case, is magnetic on both sides and ther's no chance of opening if you drop the phone. Is a little bit heavier than normal cases for this reason but very good quality and not to mention the fab ted baker design. The mirror doesnt touch the screen at all as I was afraid it might do, is a good safe distance in the background of the cover. You can also attach the phone on metal surfaces, it gets a good grip. The case is very pretty and a handy mirror on the inside. It's solid and feels like my phone is well protected. Lovely rose gold brushed effect edges. Very well made and worth every penny. Bought this for my wife who has a new Samsung Galaxy S9. Very impressed with the quality of the Ted Baker case. This has been bought as an Xmas gift for my wife, (to wrap her new S9). It looks very pretty in the box, but I can't comment on its quality just yet. Service from Mobile Fun very good as always! This case is excellent quality, looks amazing and fits my phone perfectly. Can't fault it at all. Very petty nice and sturdy mobile case. Just as expected. Pretty sturdy and fits the phone perfectly. Very good case , love the mirror . Fits my phone nice and snug. Usual good quality of a Ted Baker phone case ..... mirror is a nice touch. 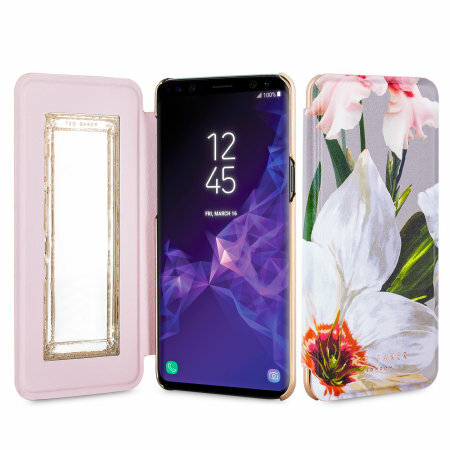 I was looking for a pretty and yet strong cover for my samsung s9 and found this one on mobile fun. They were much cheaper than other websites and delivery was a lot faster than expected. Love my new Ted Baker case and it has received lots of compliments. The mirror is great for lippy & mascara. All in all a solid case that seems to be a great buy. Great product - very stylish and reasonably priced in comparison with other covers for this phone. This is a beautiful case and fits the phone very well. Very classy - love it! Although expensive this case is worth the money. Really good quality that looks stunning while protecting the phone. I was surprised to find that the entire case wasn't all mirrored, but I like it better this way! No need for a screen protector that hinders my texting. I love that I can just flip it shut and my phone stays protected and shut. I love to be able to check my teeth and makeup wherever I am without lugging a compact mirror along with me. All I need is my phone! Very beautiful and practical case. Expensive, but worth it. Lovely colour and very sturdy. Excellent quality and fitted the phone perfectly. Would definitely recommend.